Toilet Brush Holders. You can fold the kettle down. and it is perfect for traveling as this will take less space when traveling or storing. Cast Aluminium. With high design standards at unbeatable prices. 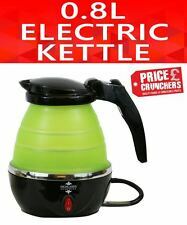 12V ELECTRIC TRAVEL KETTLE. FITTED WITH AUTO ON/OFF SWITCH. This 12V travel kettle is a perfect way for making hot beverages on the go. Other features include a On/Off switch and ample 1 litre capacity. Explora® 12V Electric Car Travel Kettle. - 12V DC plug. 1.7 Litre water capacity. 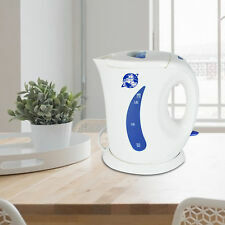 The Cordless electric kettle has the following features Transparent water level. 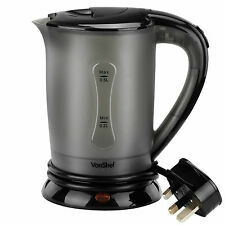 24V ELECTRIC CAR KETTLE TRAVEL CAMPING CARAVAN BOILING WATER SOCKET TEA COFFEE. 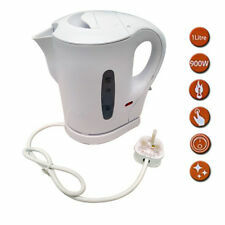 Easily switched on with a simple on and off switch and an indicator light also to show when the kettle is on or off. Here you?ll find the latest and greatest products. The kettle itself is made from siliconised heat resistant rubber, PP and has a stainless steel base. You must take reasonable care of the products that you wish to cancel and not use them. Can be folded after use, save your space. 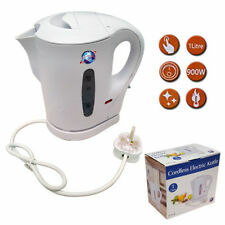 Easily switched on with a simple on and off switch and an indicator light also to show when the kettle is on or off. LEADS Weekly Deal1 Weekly Deal2 Weekly Deal3 Other. Approximatey 950mm of cable provided for flexibility. Stylish stainless steel. Hinged lid with push button release. You must take reasonable care of the products that you wish to cancel and not use them. Two water level indicators. Removeable, washable filter.